I recently read a paper with an interesting concept. Unluckily I couldn’t find it to post a link here... Anyway Mathis stated that a spinning photon that became a recycling particle has an effect on the ambient field that makes smaller particles spinning in the same direction (photons) move into its North Pole, and the ones with opposing direction (antiphotons) into the South Pole. This effect is based on collisions. I think and propose that there is also another effect. The result of these collisions that moves photons down into the North Pole will also form an upward jet of antiphotons. At the same time, near the South Pole where antiphotons are knocked up into the pole, photons are knocked down away from the engine-particle. Do you think this can be accurate? This would give us some more data about channeling into atomic nucleus, electron placements and molecular bonds. Hey Ciaolo, unluckily for me, without benefit of the paper, I'll likely get this wrong. I’m exceeding known bounds. Tell me where you disagree. A spinning photon travels at lightspeed. I don’t see how a X, Y, or Z spinning photon can “recycle” while traveling at lightspeed, the collisions are too infrequent. A photon arriving at the pole of larger spinning photon traveling at c, is a head on collision that likely drops their forward velocities to essentially zero while the spins may still spin at c. At which time, assuming the outer spins aren't striped, their spin levels begin to fill with photons, and the particle begins to recycle. The particle begins to emit photons while drawing photons in one pole, and antiphotons in the other. You can see how the volume of space around the recycling particle has begun to fill with emission photons that are very magnetic. Those emissions interact strongly with adjacent spinning particles. And so, I believe that higher level spinning photons become recycling charge particles when their forward velocities drop below lightspeed, provided they aren't stripped in the meantime. I believe I've described your situation above. In the Sun’s Galactic Orbit thread. Nevyn’s got me thinking about how particles may lose their “energy” if incoming charge became unavailable. I think I need to add to that discussion here. Given the above, the answer that occurs to me now is that larger charged particles without emission photons are very exposed. The outer spins easily stripped. The next collision may then allow the photon to continue its light speed journey. Recycling photons are what holds matter together, matter would dissolve without them. My main proposition is about the effect of the engine, not the engine itself. The ambient field is composed of “photon”s and “anti”s, according to the engine spin direction. It precence results not only in antis going into the South Pole and photons going into the North Pole. It results in all photons going down and all antis going up. The effect I’d like to scrutinize is the photons going down from the South Pole area and the antis going up from the North Pole area. The spins of the Bphotons in the ambient field will cause a pure collisions effect that will align photons and make them go into the stacked spins from the North Pole, and align antiphotons in the same way to the South Pole. EDIT: I produced a diagram, the particle is blue to show which arrows are photons and which are antis. Sorry Ciaolo, I admit it, I took advantage of your first post to try and outflank and continue my comments to Nevyn. Your second post restores my attention. I’m glad to see you’ve begun making diagrams. I’m still contemplating your Earth to Moon to Earth nested recycling loops, a nice detail I don’t recall ever having seen before, very appropriate to our current charge being ‘turned toward the poles’ discussion; but I digress. I can almost recall reading the text you’re referring to. I’m thinking it’s a recent paper. I believe Miles gives some description “of the engine”. How the bottom of the particle is generally made of matter and the top was originally antimatter, which set up the conditions. Ciaolo wrote. I think and propose that there is also another effect. The result of these collisions that moves photons down into the North Pole will also form an upward jet of antiphotons. At the same time, near the South Pole where antiphotons are knocked up into the pole, photons are knocked down away from the engine-particle. That is confusing. You’re suggesting complementary charge flows outside the particle that somehow result in reverse jets at the poles? I cannot imagine how collisions force photons down to the north pole where they somehow break free (?) and form a reverse jet of antis(?). As we know, photons usually enter the south pole, and antis usually enter the north pole. The diagram is likewise confusing. On the basis of just the external, outward pointing arrows - you show no incoming charge - I would call it “charged particle emissions”. Within the particle itself, you included the charge paths only for equatorial, or (+/-)30deg emissions. Clearly, you’ve omitted the direct N/S charge channel through the particle. That seems to be your intent, to draw our attention to your proposed polar emissions. What are their magnitudes based on? Given all that, I agree with your central argument, the particle sets up ambient field currents surrounding the particle - is that correct? Any discussion of such currents must include the main charge channel which drives those side currents. Thank you for your questions, I’ll try to clarify. You’re suggesting complementary charge flows outside the particle that somehow result in reverse jets at the poles? I cannot imagine how collisions force photons down to the north pole where they somehow break free (?) and form a reverse jet of antis(?). As we know, photons usually enter the south pole, and antis usually enter the north pole. If a collision moves a particle down only if that particle is a photon, that same collision will move an antiphoton up. That’s what I propose is happening at both poles. The diagram is likewise confusing. On the basis of just the external, outward pointing arrows - you show no incoming charge - I would call it “charged particle emissions”. I purposefully omitted incoming charge because it’s not important and would make the diagram more confusing. Within the particle itself, you included the charge paths only for equatorial, or (+/-)30deg emissions. Clearly, you’ve omitted the direct N/S charge channel through the particle. In my diagram there is an emitting particle (like the proton), a through charge should be expected for non emitting particles, like the neutron. That seems to be your intent, to draw our attention to your proposed polar emissions. What are their magnitudes based on? I expect it to be similar to the equatorial emissions. I’ll try to improve my diagram, I need some time to think about it. I thought about the incoming charge channel problem, and I think we don’t need definite channels that go into the poles. Actually, we don’t even need the poles/equator channels, which are a result of the engine particle rotation. The engine particle is made of a spinning smaller particle, that will collide with charge photons, resulting in change of trajectories of those photons. They will go “inside the spins” or “away from the spins” based on the smaller particle rotation direction and the photons’ rotation directions. If this engine is not rotating, it will take incoming charge from everywhere and emit from everywhere. The same is true for a rotating engine, but it also has a tangential velocity/movement that makes collisions less and less coherent the more near the equator they happen. I will produce another diagram, that illustrates the possible paths of an incoming charge photon, independently of the engine axial rotation. In this diagram a photon is such because its zspin has the same direction of the engine zspin. I also suggest that a stable engine (like a planet) inhabits a local ambient field with charge particles that travel linearly mainly on the engine equator plane (that plane being some type of average of all the directions in the ambient field). Basically it is bombarded into that configuration. We have Mercury as an example, almost 0 degrees from the sun blast. Continuing from this, in a rotating engine there are a lot of coherent collisions at the poles and we can expect something like a cone of antiphotons that connect the North Pole to the 30 degrees south parallel and a similar (upside down) cone of photons from the South Pole to 30 degrees north. Outside of the pole we only have the principle of cones, because the engine is like a shield for the internal cones, and out there the photons will be deviated again in the general plane by the other photons. The same happens when the photons exit the particle at 30 degrees, they collide with the ambient field charge photons and deviate back to the original plane. Sorry if I write again. If we accept these “poles cones”, we can see that electrons may live in these blasts by also strengthen them. Mathis suggested they live in incoming cones, so I have an alternate explanation. I must also add that my diagrams refer to equatorial emitting engines, not poles emitting (like the neutron). I’ll think about what to expect with them. I can definitely agree that there are ambient currents surrounding charged particles. For example, I believe sufficient yet unequal (matter/antimatter) photonic charge flows between atoms will produce a net electron flow outside of the main charge channel. I believe that is how electric current – electrons – move through a conducting copper wire. Ciaolo wrote. we don’t need definite channels that go into the poles. Airman. You suggest there’s another spin polarization process at work, independent from the spinning particle’s usually understood axial or equatorial emissions. It has nothing to do with the spinning engines’ main charge channel. You’d prefer the particle remains stationary, in order to focus more directly on the process you are trying to describe. I believe you're saying the charged particle is actually created by a smaller spinning particle inside the charged particle. Well, I suppose that’s something like the stacked spin simulation; where the gyrations of a single b_photon define each and every charged particle’s spins. 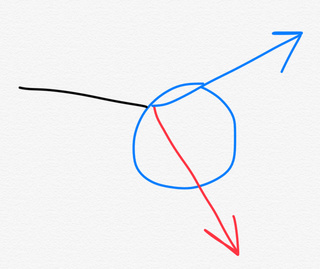 Your first diagram – you need to title them - shows a photon entering the particle from the left will be diverted either upward (blue) or downward (red), due to the spin orientation of the incoming photon. You said the same collision could result in either of the two outcomes. Photons entering the charged particle from any direction (not the poles) would be similarly spin sorted. This would create the emissions shown in your second diagram. I personally disagree with your idea and diagrams for many reasons. I’ll give you one – my own idea. I believe each of a particle’s spin levels are filled with recycling IR charge photons. An incoming +/- photon penetrating a charged particle would not be diverted either upward or downward in the manner you’ve described, I believe it would meet a blender of rotating spin levels filled with coherent photons; instead of being diverted up or down the photon must go with the spin flows and/or be striped of it’s own. But that's just my opinion. I’m trying to interpret things in your favor, but I’m usually wrong, you've been patient in correcting me. I’ve been accused of being too nice. If all that’s true, knock three times. Keep trying. Please make your ideas easier to understand. Thank you for taking your time to answer. I can clearly see that my posts were confusing and I apologize. - An engine is actually a smaller particle with x, y and z stacked spins (it may be a Bphoton or another engine). - charge enters an engine at the poles and exits at 30 degrees from the equator. - this results from collisions in the ambient field caused by the presence of the rotating engine. - somehow photons enter the South Pole and antiphotons enter the North Pole. Starting from this, I made my first proposition: if a collision is the reason a photon goes up, that same collision would cause an antiphoton to go to the opposite direction. Thus, I suggested that at the poles of a spinning engine we’d find jets of charge (antiphotons from south and photons from north). After that I suggested that if we take collisions as the only reason charge enters an engine, we don’t need perpendicular incoming charge channels at the poles. The ambient field (average) direction is on the equator plane, so collisions are between the spinning inner particle and the charge photons. Why do we have antis enter the North Pole? Because, taking what I proposed earlier, collisions results in antis going down and photons up. I also made the example of a non rotating engine. This is theoretical, because bombardment would surely start a rotation. I did this to propose that the north to 30 degrees channels are the result of the rotation, that keeps the poles stationary and the equator moving (from the point of view of charge photons). I’m surely simplifying, maybe oversimplifying, in order to clearly see the core ideas and behavior. In the nucleus papers Mathis rightfully talks about a spinning emitting engine inside protons and neutrons (actually it’s the electron), and studies the possible spins directions. That’s much more complex than what I’m using as examples here, even if I talk about generic engines. Ciaolo. Thank you for taking your time to answer. I can clearly see that my posts were confusing and I apologize. Airman. I’m certainly confused, but no apologies are necessary, we’re all trying to understand Miles’ work. The problem is, I’m not sure if you think you are providing additional possibilities in charge recycling or are you suggesting a completely alternative charged particle charge recycling theory. Airman. I disagree. When Miles uses the word engine, he could mean any charged particle. Any charged particle recycles charge and so it may be called a charge recycling engine. I do not recall Mathis ever suggesting that charged particles contain smaller charged particle engines. Airman. Agreed - the ambient field is made of charge photons. I also disagree - why describe ambient charge as a spin level above a Bphoton? Ciaolo - charge enters an engine at the poles and exits at 30 degrees from the equator. Airman. Agreed, that’s part of the definition of charge recycling, all charged particles tend to receive charge at the poles and emit charge from the equator. I disagree if you are talking about a smaller engine instead of the charged particle. Ciaolo - this results from collisions in the ambient field caused by the presence of the rotating engine. Airman. I must disagree. First, “this results” is a non sequitur; I suppose you’re referring to your the previous point - saying the presence of the rotating engine causes charge to recycle from the pole to the opposite 30 degree latitude. But that isn’t logical, because recycling occurs internal to the particle while collisions in the ambient field are external to the charged particle. Ciaolo - somehow photons enter the South Pole and antiphotons enter the North Pole. Airman. Why do you say somehow? This is standard charge recycling. Photon emissions from the charged particles’ equator results in a higher charge density in the emission plane and a reduced charge density at the poles where upward spinning photons may enter the south pole, and downward spinning photons may enter the north pole. Ciaolo - Starting from this, I made my first proposition: if a collision is the reason a photon goes up, that same collision would cause an antiphoton to go to the opposite direction. Airman. I disagree. I don’t see how you could reach such a generalization. A photon and an antiphoton cannot experience the same collision from the same direction, they would be going in opposite directions. Your diagram showing a plus or minus photon entering a charged particle from the left and being diverted to the right side’s +/-30 degree latitudes, depending on the photon’s spin does not make a convincing argument, you need to prove it, or find you’re mistaken. Ciaolo - Thus, I suggested that at the poles of a spinning engine we’d find jets of charge (antiphotons from south and photons from north). Airman. I disagree, the emission jets you describe don’t exist, you’ve got it backwards. We find jets of photons emitted from the north pole, and jets of antiphotons emitted from the south pole, these emissions are the result of direct, two-way pole-to-pole charge traffic. Ciaolo - After that I suggested that if we take collisions as the only reason charge enters an engine, we don’t need perpendicular incoming charge channels at the poles. Airman. The statement “We don’t need perpendicular incoming charge at the poles” is not justified. You aren’t clarifying, or making a better description, you’re just repeating yourself. Ciaolo - The ambient field (average) direction is on the equator plane, so collisions are between the spinning inner particle and the charge photons. Airman. I disagree. It is false to say the ambient charge field direction is on the equatorial plane, the ambient field is comprised of photons from all directions. The charged particle, say a proton, is a recycling charge engine that redirects ambient photons from all directions into the emission plane. Ciaolo - Why do we have antis enter the North Pole? Because, taking what I proposed earlier, collisions results in antis going down and photons up. Airman. Of course we have incoming antiphotons enter the north pole, and incoming photons go up into the south pole, that’s standard recycling. I still disagree with the statement “collisions results in antis going down and photons up”; antis go down and photons go up because of their spin directions, not because of collisions. Ciaolo - I also made the example of a non rotating engine. This is theoretical, because bombardment would surely start a rotation. I did this to propose that the north to 30 degrees channels are the result of the rotation, that keeps the poles stationary and the equator moving (from the point of view of charge photons). Airman. I thought you wished to describe the non-rotating engine in order to separate the “standard” charge recycling theory from the recycling mechanisms you were proposing. The thirty degrees emissions are part of the standard recycling theory, they do not support your possible alterative mechanism. Ciaolo - I’m surely simplifying, maybe oversimplifying, in order to clearly see the core ideas and behavior. In the nucleus papers Mathis rightfully talks about a spinning emitting engine inside protons and neutrons (actually it’s the electron), and studies the possible spins directions. That’s much more complex than what I’m using as examples here, even if I talk about generic engines. Airman. You are oversimplifying by not providing sufficient description, rationale or justification in support of your ideas. You keep repeating oversimplified assertions in ways I cannot agree with. For starters, please provide a reference paper where Mathis “rightfully talks about a spinning emitting engine inside protons and neutrons (actually it’s the electron), and studies the possible spins directions”. It’s long, I’ll also re-read it. An other thing, where you talked about the jets at the poles, you missed that I was suggesting the same scenario (antis out from the South Pole and photons out from the North Pole), not the opposite. The difference was the cause: I said that they are not entirely due to passing through charge, but also to collisions. 232. A Reworking of Quantum Chromodynamics, http://milesmathis.com/quark.html while dismissing the quark, the bosons, the gluons, the strong force, the weak force, and the Higgs field. Also including a new analysis of beta decay. 22pp. Great paper Ciaolo. Miles replaces Quantum Chromodynamics (QCD) with his far simpler physical description of various quanta that exist in the four spin levels from electrons to baryons. After discussions involving baryons lately, this paper helps nicely. I see I was incorrect to assume the ambient charge field is comprised of IR photons. For particle interactions at the nuclear scale, emissions are almost entirely B-photons. Note that the B-photon emission field of an electron is upside-down to the B-photon emission field of the positron. Not all particles have emission fields, such as the neutron. I believe the following two quotes capture the essence of the paper. In the first, Miles provides a clean 16 member list which I’ve tabled to save space and make it easier to see. The +/-a spins belongs to electrons or positrons. The next quote seems essential to our discussion. … As we know, every particle is a wave, and we can now see that it is a wave with four possible inner structures. In a field or during inelastic scattering, inner spins will act like constituent particles, since they will have not only their own directional forces, they will have their own diameters which are less than the particle’s apparent diameter. The four possible inner structures will act like constituent particles in that they have their own forces. I do not believe one can interpret that to mean that there is an electron or a meson engine in a proton. Please correct me if you believe otherwise. We have the stacked spin model – Nevyn’s stacked spin applications https://www.nevyns-lab.com/science/spin-apps.php or Jared’s latest vimeo in the Photon Sinewave Travel thread. That is the closest we’ve come to understanding a particle comprised of four stacked spins. Miles says they have emission fields, we have not yet incorporated charge recycling into our stacked spins. How do you think a stacked spin nuclear charged particle will recycle B-photons? Thanks for accepting criticisms, it's difficult but not personal. Feel free to return the favor. We all benefit by bouncing our ideas off each other. P.S. We know photon and antiphoton jets are primarily caused by direct pole-to-pole charge traffic. I think I understand how you believe jets might also form, but that is now moot, since I believe your model must change. I don't think I can agree with that quote (sorry Miles). The inner spins do not act like inner particles because all spins are applied at the same time. Every motion is integrated together at every step. While inner spins are faster, in an angular sense, they are no where near fast enough to be considered their own particle. They are only the square root of 2 slower between consecutive spin levels. That is 1.414 times slower or 0.707 faster, which ever way you want to look at it. In order to consider inner spins as particles, they would need to be able to complete at least, and probably a lot more than, 1 revolution before the higher spin applies its own motion and that is just not the case. I think what Miles is getting at is that the inner spins are protected by the outer spins. That is how I interpret 'in a field or during inelastic scattering' which means he is talking about particles in collision. While they do have their own forces, I don't believe they have their own diameters. Some might say that every spin level has a diameter, and that is correct, but that is not the same thing as it being a particle with a diameter. Miles also mentions a similar thing in a paper about protons in particle accelerators where he says that the proton gains spins but those additional spins do not emit charge. The proton still emits its usual charge (actually a reduced amount since the velocity of the proton is so high) but those higher spins do not. I can't see how to reconcile that with the spin velocity relationships that I have found. As I think about this a bit more, I think it would a good idea to see how these numbers play out. At what point does an inner spin complete 1 revolution in the same time that the top level spin only moves a small amount, let's say 1°? That ignores higher axial spins because they are a pain to deal with and I don't believe in them, but mostly because they are so hard to incorporate in a quick analysis. The first entry represents the BPhoton's axial spin but all other entries are X, Y or Z spins. You can see that it takes 18 spin levels to reach 360. That is larger than a proton and has to go all the way back to the BPhoton to get a complete revolution before the 18th spin level rotates 1°. That is 131072 times the size of the BPhoton. Note that if we included higher axial spins then the difference would be even more because you would have to add another spin level every 3 levels and that added level does not increase the radius so we end up with more spin levels in between but the size difference remains the same. That is an incredible size difference and we are already above a proton which I think is about 14 to 16 spin levels or is that an electron, I'm not sure but they are close to those levels. My point is that you have to go back a lot of spin levels and radius doublings to get to something that might be considered a particle. Too far, and the more spin levels you add the further apart they get because the rotation speeds are not doubling but increase by root 2. I do find it interesting that it took about 18 spin levels in the above analysis. That does get close to the electron and proton levels. Could this be related to them being charged particles? Is this the relationship that somehow causes them to become charged? Is it the synchronization of those far apart spin levels that allows the charge engine to fire up? While I am disagreeing with the original quote, I think there may be something to it. Something deeper than what Miles was trying to get at. I don't think it is related to the protection of spin levels but it could be related to the charge engine. 'in a field or during inelastic scattering' certainly refers to collisions, but I interpreted Miles’ comment was necessary to account for possible varying force measurements or results. To say you can’t agree with "the quote" seems excessive, and requires clarification. How do you feel about the first sentence - As we know, every particle is a wave, and we can now see that it is a wave with four possible inner structures”? What is an A,X,Y,Z particle? Is it a volume of space through which the A particle is spinning? Isn’t that what Ciaolo basically believes? I've been thinking of little else for a couple of days now. In any case, I feel that there is more here than we've realized. I see your last post, good to see some possibility. Yes, I agree with that part of it. Although I wouldn't call them a structure, just a path. But if you look at those paths, over time, they do appear to create what one might call a structure. However, there is nothing that resembles a particle. I also wouldn't say that a particle is a wave. It is a particle that expresses a wave. I wouldn't call my legs a wave but they are capable of expressing one. A fine point, maybe, but I feel it is important to be clear. I do slightly disagree with Miles' analysis of the +/- spin directions and how they work but not by much. 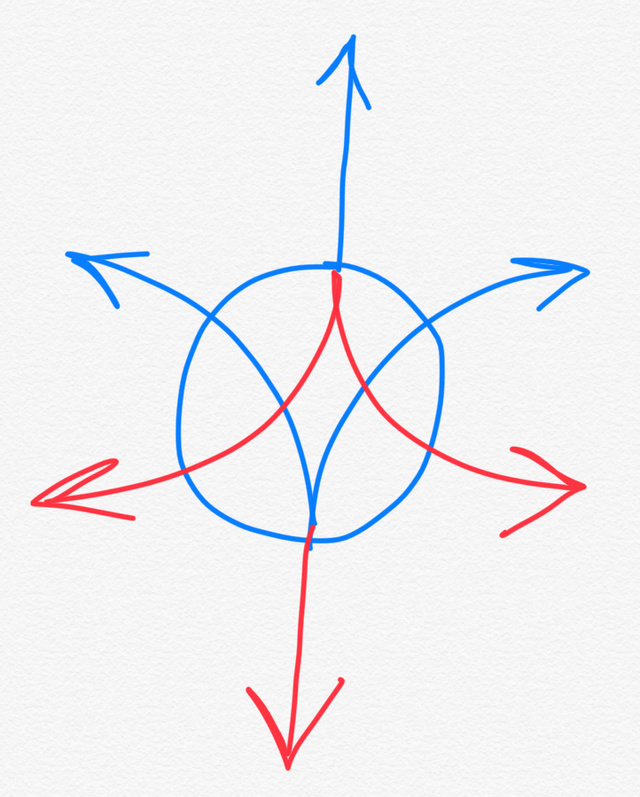 I have found that you only need to look at the top 3 spin levels (the axial spin, if you allow it, plays no part) and you get different spin paths depending on whether the X spin and the Z spin are the same sign (or spin direction) or not. The Y level doesn't even really come into it other than causing mirroring of the path. You can set all of this up in SpinSim and see the differences. I believe I have posted images here before but I couldn't find them when I looked yesterday. They must be in some thread that got off topic a bit. What is a particle? In the truest sense I would say there is only 1 particle and that is the BPhoton. However, to remain somewhat consistent with the mainstream mangling of that term, I use particle to describe what the BPhoton and its spins create. That allows us to call photons, electrons, protons, neutrons, etc, a particle. Completely wrong, but what can you do about it? So, yes, I agree that the A, X, Y and Z spins are the path that the BPhoton takes to create a particle. It isn't really a volume, but it encloses a volume or it happens in a volume. I'm getting pedantic again, bare with me. If you freeze time, then there is no volume. You are left with a single BPhoton. It is only over time that the path creates a volume within itself so the volume is kind of conceptual, rather than physical. It is also completely possible for other particles to move through that volume without colliding with the BPhoton so it is not a boundary either. Or you might call it the boundary of the BPhotons motion but not a solid structure. Yet it acts like a boundary, at times. It is the only place that a collision with the particle can take place so it will certainly appear as one. Ciaolo has made comments here that I agree with and some that I don't but I am happy to see where you guys can take them. Even things I disagree with can lead me to new thoughts and ways to see all of this stuff. I might even see that I was wrong and change my view. I made that post above because I thought the discussion was heading down a bad path and I might be able to throw in some math to show it and what-do-you-know, it might have just shown me a thing or two.